“Good morning. 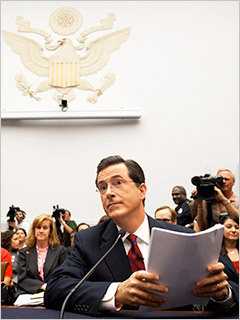 My name is Stephen Colbert: television personality, comedian and resident of New York. I would like to thank the committee and its members for their time today and their open minds as I present my statement for the record. In July of 2010 — in the midst of Arizona’s immigration firestorm — I welcomed Arturo Rodriguez, president of United Farm Workers of America, as a guest on my television show to discuss the impact on harvests in California’s Central Valley. During our interview and subsequent conversation, I learned of his “Take Our Jobs” campaign; offering unemployed Americans farm work, providing necessary training and addressing the chronic and endemic shortage of agriculture laborers across the country. While an enthusiastic endeavor, the project recruited a mere three participants. As a comedian and satirist, the temptation of subjecting my character to manual labor proved impossible to resist. I offered to be the fourth. Joined by Congresswoman Zoe Lofgren — longtime advocate for farmworkers’ rights — I traveled to Upstate New York, where I spent 10 hours picking beans, packing corn and learning about the stark reality facing American farms and farmers. I learned that many farms are closing, growers are planting less or switching to other crops, and the production of fresh foods and vegetables is moving abroad. I learned that American farmers have moved at least 84,155 acres of production and 22,285 jobs to Mexico, and that between 2007 and 2008, 1.56 million acres of U.S. farmland were shut down; 1.56 million acres is about twice the size of Delaware. At the request of Congresswoman Lofgren, I am here today to share my experience as an entertainer turned migrant worker and to shed light on what it means to truly take one of the millions of jobs filled by immigrant labor. They say that you truly know a man after you’ve walked a mile in his shoes, and while I have nowhere near the hardships of these struggling immigrants, I have been granted a sliver of insight. Print article This entry was posted by Chris Stout on September 24, 2010 at 10:42 am, and is filed under News. Follow any responses to this post through RSS 2.0. Both comments and pings are currently closed.